suspension does this by absorbing the road bumps into springs and shock absorbers. assists our braking ability and steering accuracy. 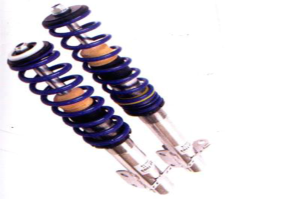 SPRINGS: Springs are an important part of the suspension and they can wear out and sag. Poor springs will effect the ride and steering and should be replaced when defective. Some loading conditions and driving conditions can require better performance springs than supplied by the original manufacturer. The manufacturer has to supply a spring that gives a comfortable ride under normal conditions. If your requirements exceed normal conditions many good quality aftermarket performance springs are available. Some performance manufacturers such as King Springs, Pedders Springs, Lovells Springs and several local manufacturers make excellent products. We can supply and fit springs that suit your requirements and budget. Call UMR Engines Slacks Creek Brisbane for more information. the same, the tomato absorbs the force through it soft texture while the cricket ball dissipates the force back through your head ….ouch! So when a heavy car tyre hits a bump the resultant upwards force is absorbed through the oil or gas filled shock absorber rather than through the vehicle back to you. The complex driving conditions of cornering, acceleration, bumps and braking all exert forces that may cause the tyres to loose contact with the road, the shockie’s job is to eliminate or reduce any adverse effect from these conditions. Worn shock absorbers are responsible for abnormal wear of expensive tyres and can cause dangerous conditions when braking and cornering as your tyres may loose contact with the road. We can replace your worn shock absorbers with ones that are most suitable for your driving conditions. Call UMR Engines Slacks Creek Brisbane for all your suspension needs.